Prt. 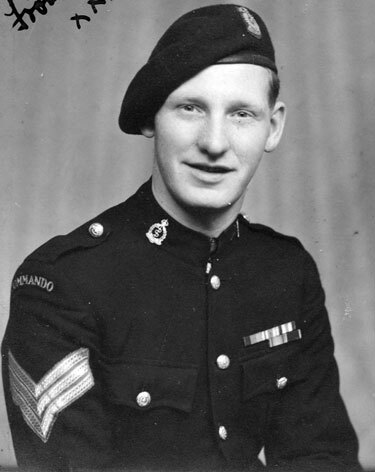 Herbert “Bert” Thompson, formerly of the RAMC, served in HQ Troop of No.6 Commando from, at least, 2nd August 1940. Promoted to L/Cpl on the eve of the Operation Torch invasion of North Africa, 7th November, he continued to serve with the unit being wounded twice in January 1942. He returned to the Commando for the voyage home to the UK and took part in all training activities for the invasion of Europe. Landing on D-Day and serving with the unit until their return to the UK in September 1944, whereupon he transferred back to the RAMC. He was promoted to W/Sgt on 5th August 1944.